I find this dish to be one of those that has the comfort factor, fond childhood memories and something warm and spicy to eat in the cold weather. We tend to use the basic mix of vegetables similar to what is put in samosa filling – potato, carrot, peas, sweet corn, and onion, however you can use any mix of vegetables you like. 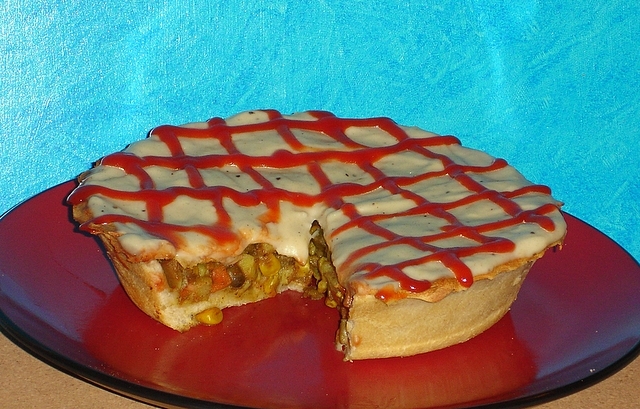 As the filling is not very saucy, the addition of the white sauce and tomato ketchup, gives it a wonderful creamy moist texture, and a surprisingly good combination to add as my husband put it. I enjoy eating the pie on its own however, you can serve it with some salad. 2) Chop the vegetables, heat the oil on medium heat in a large non stick pan (I use my cast iron casserole pot and it cooks the vegetables wonderfully). Place the onions and cook until they turn slightly brown, add the remaining vegetables, spices and lemon juice. Mix well and add the water, cover and cook , occasional stirring to ensure that the vegetables do not start to burn or stick to the bottom. You may need to add more water, cook until the vegetables are tender, keep aside. 3) Divide the dough in half and roll out the pastry on a lightly floured surface for a 9” loose bottom flan tin. Place the pastry on a greased flan tin, and pierce with a fork all over. Bake for 5 mins. 4) On the part baked pie base, add the filling and then cover over with the remaining rolled out pastry. Brush the edges with a little milk or water to seal the two edges of the pastry, press with a fork. Prick a few holes on the top of the pie cover to let the steam out and you can decorate if you want to, with cut out pastry shapes. 5) Place in a pre heated oven 180 ‘C for 20 mins or until the top is golden brown. Once done remove from the oven and leave to settle for 5 mins. 6) For the sauce heat the pan slightly, add the oil, flour, salt and pepper and mix with a whisk, ensuring no lumps are formed. Once the flour has been cooked slightly (it will change colour and have a roasted fragrance) slowly add the milk, making sure to whisk continuously. Ensure that the sauce is smooth, once it starts to thicken, switch off the heat and keep aside.